thanks Gizmo. I'll try those commands right now. I've been playing with "mount" and have noticed that it tells me info about the partitions. if "mount" will tell me the size of each paritition like lvscan does then I'll know which one because there is a huge 130 Gig paritition and a 20 Gig or so paritition. EXT3 error: group descriptors corrupted! EXT3 fs error (device dm-2): ext3_check descriptors: Inode bitmap for group 0 not in group (block 8651778) ! 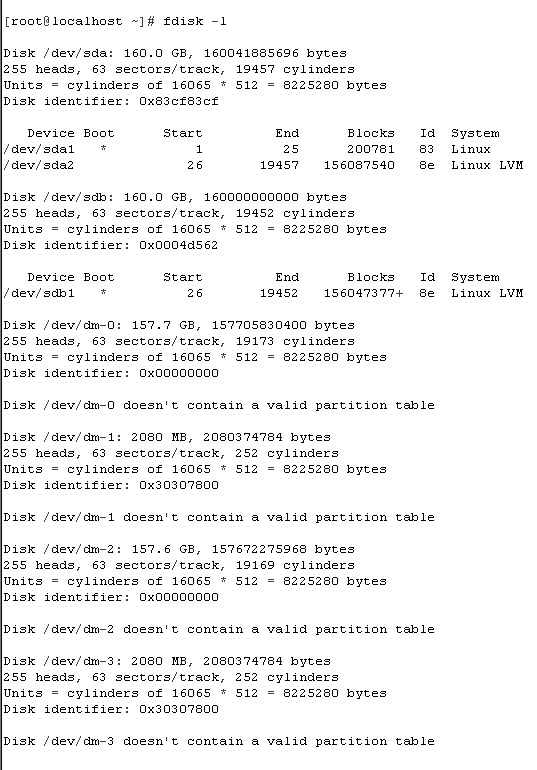 VFS: Can't find ext3 filesystem on dev dm-3. I think I've messed something up in my endeavors trying to troubleshoot. I don't mind starting over with a whole re-install but it would be nice to use the other hard-drive. Did I mention I deleted the /boot partition on this drive when I had it connected to windows? it could be that or it really is corrupt. If its too much of a hassle to revive this drive then can I just format it? Ah, your drives are being handled by LVM. Crap. I've not got a lot of experience with LVM. Frankly, I don't understand why Fedora defaults to using LVM, since it is WAY overkill for a user's machine, and introduces extra complications when things go wrong. oh, I see, so maybe I should start reserching LVM? But so far no success. I noticed that when I "mount -t lvm /dev/back-up/LogVol00" it says lvm isn't a filesystem and "swap" isn't a file system either. Let me do a little research and see if there is anything Fedora specific that I missed. I use LVM2 on a couple of rigs with Gentoo and it is simple to manage so I know it's just something I missed along the way. Don't worry about it. I ended up starting from scratch and re-installed Fedora 8. Everything is formatted and re-installed. Fedora 8 server is back up again. I'll tell ya what, I've learned alot about formatting, /dev, fstab, ext3, LVM, lvscan, etc. Too bad I'll have to find some of those old games I downloaded, but otherwise not too much of a loss. Now I have my backup drive installed so I can use Fwbackups to save my data. I plan to backup every day so I don't loose anything. Thanks for your help EVERYONE! You guys do a good job when this isn't even a Linux forum! Honestly, I'm happier with this configuration because now I've got everything formatted ext3 and I have /home on a separate partition & my /backup on a separate drive. I've installed fwbackups and did a test backup, it worked perfectly! I'm glad I have a backup now on my server. I've RMAed the 2 sticks of RAM and we'll see if that was the problem. If its the Asus PC-DL Deluxe, then I'll stick with 1 Gig for now. Any word if it will update 8 if you wisely skipped 9? Last edited by Daniel ~; 5th November, 2008 at 06:40 PM. So, for now, I've decided to stick with Fedora 8 for now because it works perfectly. Until there is some new feature that I GOTTA have (Direct X support in Wine) then I'll think about updating. Throw the DVD in and give it a whirl when it comes out (some weeks yet). Backup before you upgrade as always, and we'll try to give you a hand if you have trouble.